I’m Paul Kindzia and I’m just like you. I love jiu-jitsu and am on the path. I may have a different background than you but we still have a lot in common. I didn’t have a smooth ride in the beginning. I was a complete “newbie.” I had no idea what I was doing. Earlier in life, I did a lot of endurance sports but found that my coordination, mobility, and flexibility were very limited. I didn’t pick things up quickly in the beginning. I kept getting hurt. I almost quit a number of times within the first few months. I worked hard and committed myself. I did a lot of studying on the mats and off the mats. I’m convinced that the things that I was doing off the mats were equally important (and sometimes more important) than what I was doing on the mats. And then things started to click and I was able to make some progress. That’s when I totally fell in love with the art. By no means am I an expert at jiu-jitsu. I’m far from it. But I do love jiu-jitsu, I love writing, and I love sharing and teaching. So this entire project is just me blending a couple of arts that I am passionate about. I do have a “real job.” I’m a personal finance junkie as well. I earned my financial credentials in a never-ending pursuit of mastering personal finance with an MBA in finance and an undergraduate degree in accounting. I’m a Certified Public Accountant (CPA) and a Certified Financial Planner (CFP®). I’m an author, a husband, a dad to several rescue dogs, and a CEO of a private wealth management firm. But as I turned 40 I ran into some major health issues and suffered from a brain tumor which required surgery and a multi-year road to recovery. That process changed my life in more ways than one. I quickly realized how fragile life is and how short life can be. Now it’s all about making the days count. 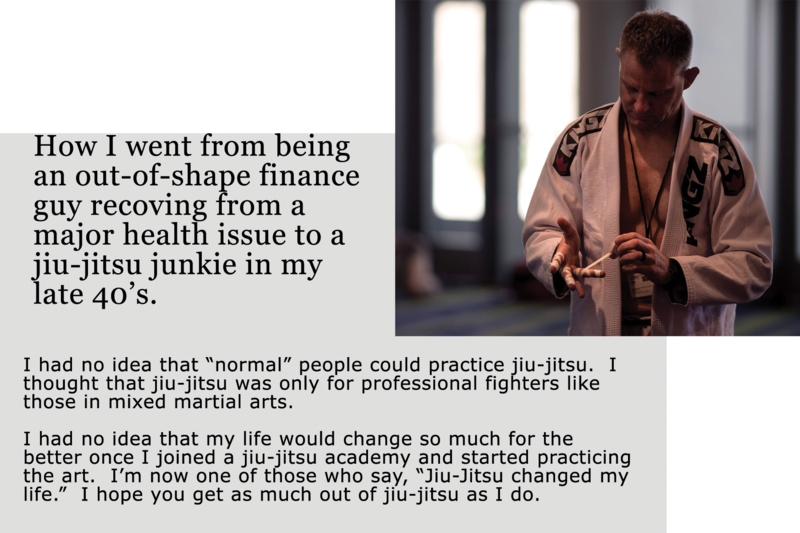 Fortunately, I have jiu-jitsu in my life and I love sharing the journey with others. Personal finance and wealth building. I love helping people get out of debt and acquiring financial stability. Building strong bonds and relationships with people. Especially those closest to me. If you have questions, reach out and contact me on the contact link on the top right of the website.